I recently created this necklace out of necessity really. Sometimes our best designs come from a lack of materials and that was the case with this necklace. My husband’s company holiday party was coming up and I found a dress that I liked. The weird part was that it had gold sequins. Now, that sounds really tacky, right? But there was a pretty layer on the top to kind of tone them down and I actually really liked the dress. The problem was, however, that I don’t wear gold jewelry ever. My jewelry is almost exclusively silver. And while I have absolutely no problem with mixing and matching metals, silver just didn’t look right in this case. So I figured I would just use brass (which ended up being a perfect match.) I had envisioned using upcycled chandelier crystals and making a big statement necklace and a wrap bracelet. I didn’t have enough brass wire, so I ordered some online during a special. And then I waited…..and waited….and waited….. Finally, it’s the day before the event and I had received notification that the delivery of my package with the wire was delayed….again. So I started digging through my supplies to see what I could make. I thought maybe I would just make something beaded without wire so that the color of the wire wouldn’t matter. Then I came across a large amount of brass chain that I had tucked away. 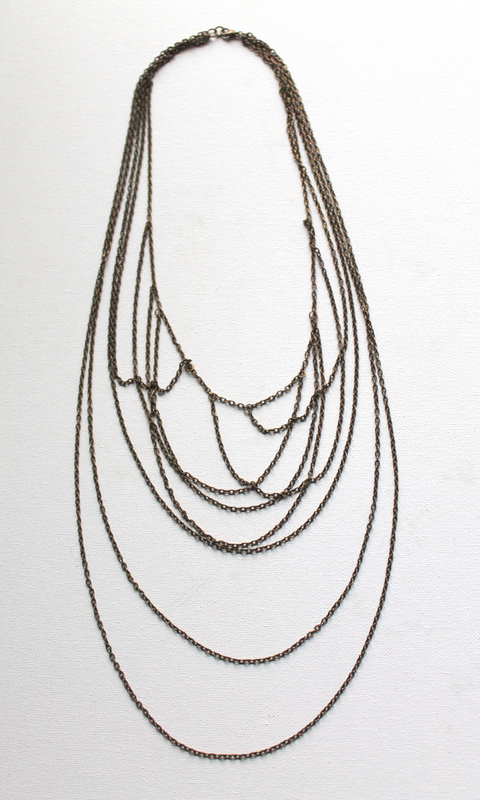 So I decided to make a draped chain necklace. I have made a couple necklaces kind of like that before, but never with so much chain. I don’t really have a step-by-step for this necklace with photos, but you can make your own, too. Chain nose pliers and another pair of pliers (I like bent nose pliers) to open jump rings. Open the jump rings. It’s so much easier to have your jump rings already opened before you start a project. That is especially true with this project. Next I decided how long I wanted my shortest part of the necklace to be and I cut the chain. That was the base of the other chains that were draping. Add the clasp to that chain. This helps because you’ll either want to put the necklace on a mannequin or you’ll need to keep trying it on as you go. I kept trying it on anyway because I wanted to see exactly how it looked on me. Start adding chain to the base chain using jump rings. You can do this however you like. If you want to keep it very symmetrical, you will want to measure each side where you add chain. Or you can just go with your eye. I left the chain uncut as I tried out different ways of draping and then I would attach the loose end with a jump ring and cut the chain how long I needed it and attach that end. 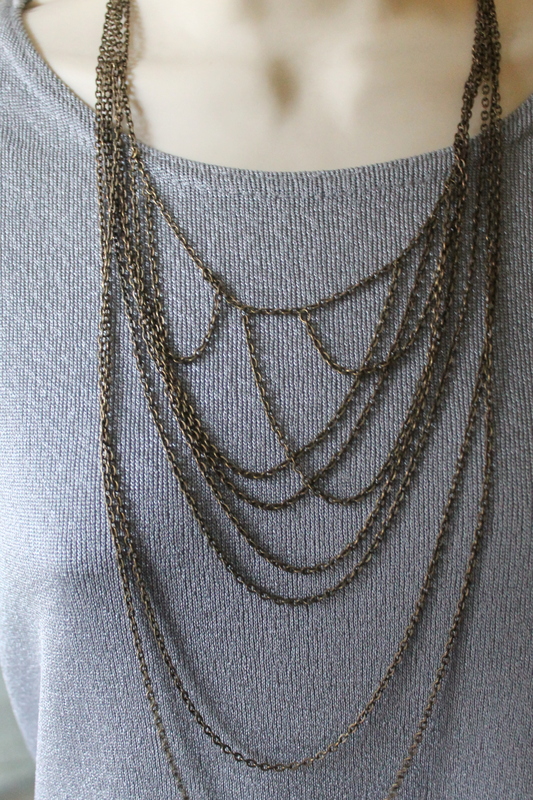 Once you complete the base, you may want to add a couple more long chains to give your necklace more length. I added a couple more and attached each end to the jump ring that was holding on my lobster clasp on one side and to the jump rings that were at the other end. Then you have your completed necklace. It is super easy for the chain to get tangled up and twisted as you go. I highly suggest using a mannequin if possible. If you don’t have one, you’ll need a lot of patience. Opening your jump rings first will really help you because you’ll get into the flow of making your necklace and then suddenly you’ll need to open a jump ring and that can interrupt your flow. 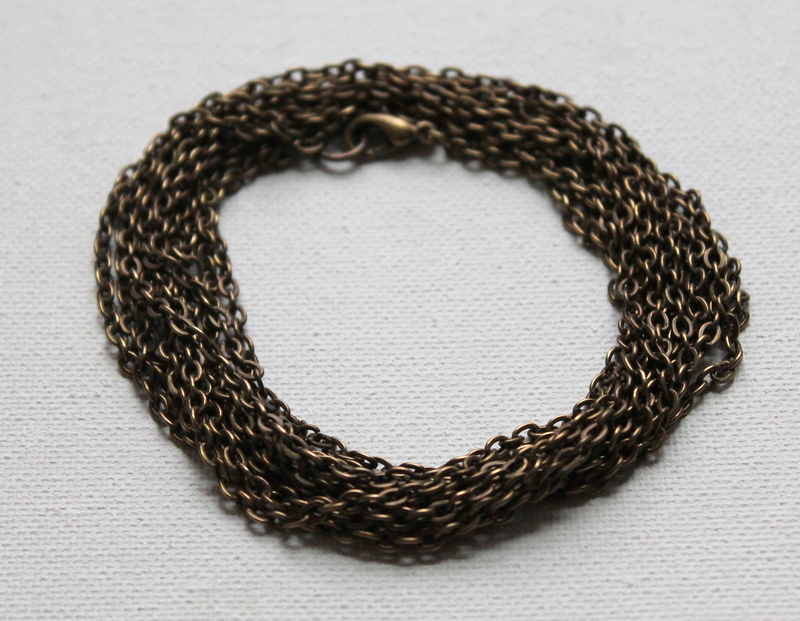 Specifically for brass: My chain had a patina on it that I didn’t want for this particular design so I used steel wool to remove it and make my necklace a little shinier. Even if you’re using a mannequin, you will most likely want to try the necklace on yourself (if you’re making it for yourself) a few times as you go so you can see exactly how it’s going to fit and lay on you. The bracelet I made to match was simply a wrap bracelet. I simply wrapped chain around my wrist how I wanted it to fit and then cut the chain and added a clasp. I also made earrings, but they were too much with the other jewelry. I made tassel earrings like featured in ECT TV Episode 30. Are you ready to try some chain? If you do, come on over to the Emerging Creatively Tutorials Facebook page and post what you made. If you have questions, you can post them there, too. 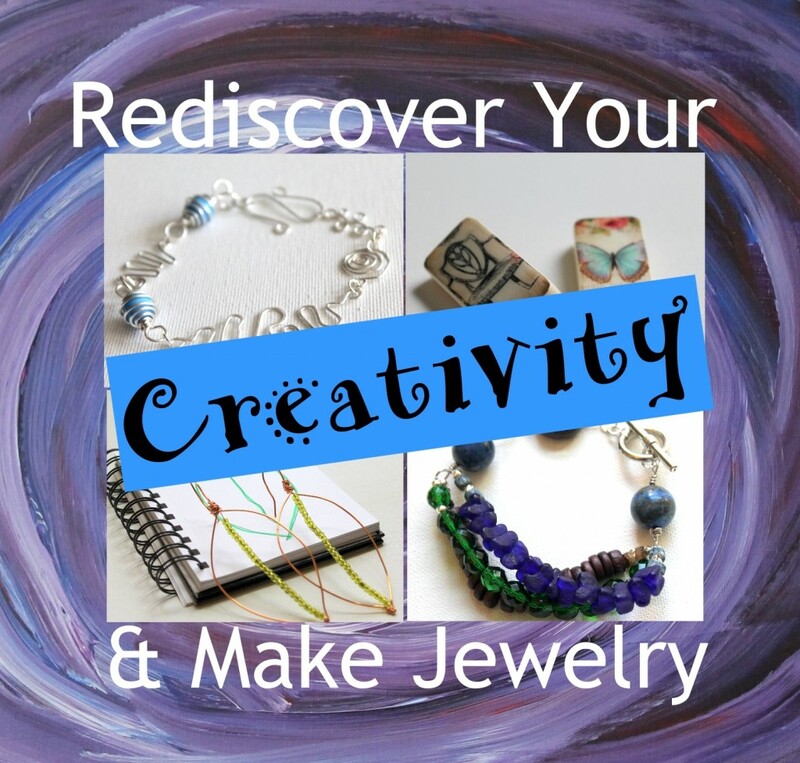 January 5th, 2015 is the first day of Rediscover Your Creativity & Make Jewelry eCourse! I have run this eCourse before, but this time I’ll be adding more projects and some helpful hints as we go along. The course runs for 6 weeks. Each week you get a Creativity Booster, Jewelry Making Lessons (for specific skills) and at least one and usually more than one Jewelry Project. It’s full of videos and PDF eBooks and you even get a complete eBook of the eCourse at the end. It’s designed so that you can rediscover your creativity (you ARE creative, sometimes you just need to find it again) or boost your creativity. Plus, as a special bonus you get my eBook, Wire Wrapping for Beginners as a special gift when you sign up. Click here to learn more and to get in at the current price. (The price is going up on January 2nd, so get in now!) Plus, the next 3 people who sign up I’ll send a hard copy of the Rediscover Your Creativity & Make Jewelry print book! This entry was posted in How to Make Necklaces, Jewelry Tutorials and tagged brass, chain, draped, draped chain necklace, how to make jewelry, jewelry making by Kimberlie. Bookmark the permalink. Love the dress and I am no fan of sequins. You are right about how the sheer material makes all the difference in the world! Great necklace and bracelet to compliment it too – glad you found all that chain, too! Thanks for sharing and Happy Holidays to you and yours! I so agree! I am absolutely not a fan of sequins, but I loved the dress.